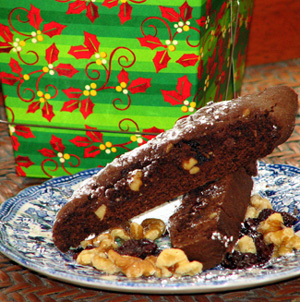 It's time for Holiday baking and one of my favorite things to make is biscotti. Biscotti, or twice-baked cookies originated in Tuscany during Columbus's time. Almonds were initially used as they were abundant in Italy, and the biscuit was used to dunk in wines and provide food for long journeys due to its long storage ability. Today, biscotti come in many flavors including chocolate and traditional anise. Various dried fruits, nuts and seeds can be added and the cookie can be dipped in melted chocolate for richness.I like to have biscotti available for a light end to a heavy meal. Their crisp texture makes them excellent for dunking in coffee and chai tea, or served with a dessert wine. Because of their twice baked process, the biscotti become dried which allows them to be stored for long periods of time, from 1-6 months in an air-tight container which is out of sunlight. 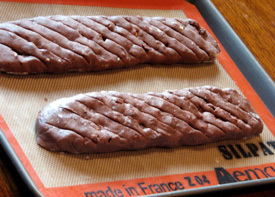 If the biscotti lose their crispness, simply reheat them in a low, 250 degree oven for 5 minutes. If they become too crisp and dry, microwave them for 30 seconds on low setting. In a bowl, or onto a flexible cutting board, add flour, cocoa powder, baking soda and salt. Into a mixing bowl or standing mixer (using paddle attachment) cream together the softened butter and sugar until a light yellow color. Slowly add eggs, one at a time. Allow to mix on low (2) for 4 minutes. Add dry ingredients (flour, cocoa powder, baking soda and salt) slowly while mixer is on low. Alternate with nuts, chocolate and cherries until all ingredients are in mixing bowl. Combine until batter comes together and ingredients are evenly dispersed. Transfer batter to a lightly floured board. 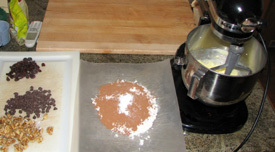 Lightly flour hands and bring batter together into a circular mound. Cut batter in half. Roll each half into a 12-inch log and flatten until approximately 3 inches wide. Transfer to Silpat or parchment lined sheet pan. Repeat with the other half of the batter. Score each log diagonally into approximately 10-12 individual biscotti. Place in center rack of oven and bake for 35 minutes. Take out of oven and allow to cool for 5-10 minutes. Cut each biscotti through and place each cookie cut side down on baking sheet. Return to 350 degree oven and bake for an additional 10 minutes. Allow to cool completely. To serve, sprinkle with powdered sugar, or gift them in a decorative tin or Holiday Chinese take-out box (pictured above from Michael's Craft Store).